Earlier today, we talked in detail about the new iPad Air, iPad mini with retina display, and the updated MacBook Pros (you can read about it here). 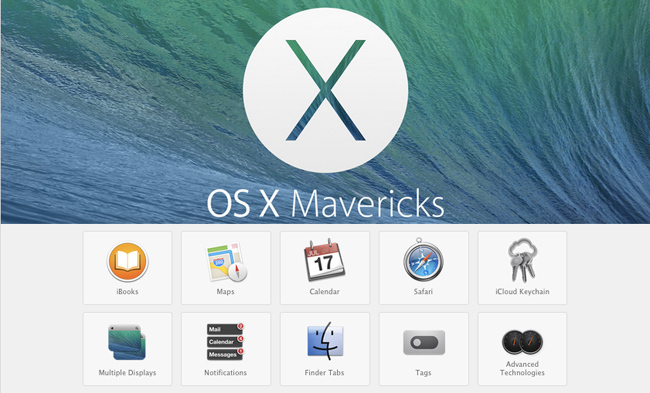 In this story, we will talk in detail about the new Mac Pro and OS X Mavericks. A cylindrical shaped device, the Mac Pro introduces a completely new pro-desktop architecture and design. It comes with next generation Intel Xeon processors with up to 12 cores- running at Turbo Boost speeds up to 3.9 GHz -and two AMD FirePro workstation-class GPUs with up to 12GB of video memory, making it up to 2.5 times faster than the current Mac Pro. The device comes with PCI Express-based flash storage, which the company claims is 2.5 times faster than the fastest SATA-based solid-state drive and up to 10 times faster than conventional desktop hard drives. The new Mac Pro will also have six built-in Thunderbolt 2 ports (completely backwards compatible with existing Thunderbolt peripherals), USB 3 ports, Gigabit Ethernet port, and HDMI 1.4 ports. Users can also connect up to three high-resolution 4K displays to the device. Interestingly, all of this is offered in an incredibly small package. At just 9.9 inches tall with a diameter of just 6.6 inches, the new Mac Pro is one-eighth the volume of the current Mac Pro. Apple's professional apps, including Final Cut Pro X, have also been optimised to support dual GPUs for improved real-time playback performance, faster rendering, quicker export, and 4K video monitoring. The new Mac Pro ships with OS X Mavericks and according to the company, it uses up to 70 per cent less energy than the previous generation, is constructed with 79 percent less aluminum and uses 80 percent less packaging material than the current Mac Pro. The cheapest one comes with a 3.7 GHz quad-core Intel Xeon E5 processor with Turbo Boost speeds up to 3.9 GHz, dual AMD FirePro D300 GPUs with 2GB of VRAM each, 12GB of memory, and 256GB of PCIe-based flash storage. This one is priced at Rs 2.29 lakh and will be available starting December 2013. Note that the prices go up depending on the level of customisation of the specifications. Maps: enables users to plan a trip from their Mac, then send it to their iPhone for voice navigation on the road. Maps integration also gives users maps from within mail, contacts and calendar. iBooks: with iBooks, users will have instant access to their existing iBooks library, as well as more than 1.8 million titles in the iBooks Store. The books work seamlessly across devices, hence users can read a book on their Mac, make notes or highlights, and then pick up exactly where they left off on the iPad. Tags: a new way to organise and find files anywhere on the Mac or in iCloud. Users can tag any file in the finder, in iCloud, or when saving a new document. The created tags appear in the finder sidebar to help view files by project or category. Finder tabs: reduce the clutter on your desktop by consolidating multiple finder windows into one window with multiple tabs. Users can customise the view for each tab, move files between tabs, and even run the finder with multiple tabs open in full-screen. The operating system also makes using multiple displays easier. The menu bar and dock are available on any display, and users can run windowed or full-screen apps on whichever display they choose, without any configuration. App Nap reduces the power consumed by apps that you're not using, while compressed memory automatically compresses inactive data. While You Were Away Notifications make sure users can view what happened while the Mac was asleep and interactive notifications, allow users to reply to a message, respond to a FaceTime call or even delete an email without leaving the app they are using. Additionally, new Safari comes with 'shared links' that enable users to discover, read and share interesting new content from Twitter and LinkedIn, all in one place. Interestingly, the company has made the OS available for free from the Mac App Store. Any Mac capable of running OS X Mountain Lion can also run Mavericks and users can upgrade to Mavericks directly from OS X Snow Leopard, Lion or Mountain Lion. Note the minimum requirements for running OS X Mavericks is OS X v10.6.8 or later, 2GB of memory and 8GB of available space.